Gudang Garam International Merah, filter kretek cigarette, is the top-selling cigarette compared with any other kretek cigarettes in the world. 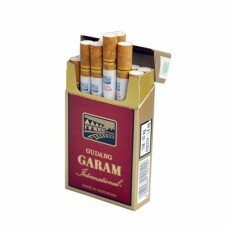 This most popular cigarette brand is the evidence of Gudang Garam high quality products. Its excellent taste and flavor is a result of expert selection of ingredients and rigorous processing - expressed as the character of Gudang Garam International: Pria Punya Selera ("Man,s Taste"). In line with this concept, this cigarette is made for men having a tough personality, modern style and good appreciation of the real art of smoking. This kretek cigarette is available in 12-cigarette and 50-cigarette packs. 1 carton contains 12 packs.